Is your beach baby ready for the sun and surf? We have everything you need including transportation to and from the sand. When your child arrives, they will be met by fish, birds and shells along with other beach favorites like palm trees and pineapples. Don't forget your good luck tiki statue! 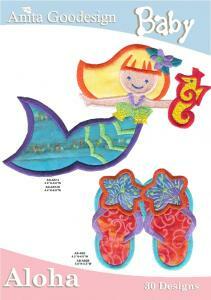 "Aloha baby" even has cool duds for your baby, colorful flip-flops and "here I am sunglasses"! Try all the projects that are included in the tutorial, so you can make up the whole nursery in the typical beach bum style.